EXCLUSIVE Beauty is coming their way! 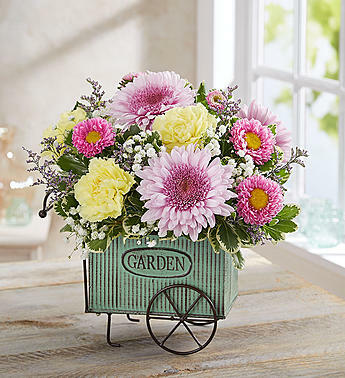 Overflowing with bright spring blooms in shades of peach, pink, lavender, and yellow, our exclusive rustic French flower cart is gently brushed in soft blue with a vintage beveled design and "GARDEN" imprint on front. The enjoyment doesn't stop when the flowers expire, either: This charming-and functional-piece can be reused for planting or holding gardening tools.